When it comes to leadership psychology, empowerment and motivation, the name Tony Robbins is possibly the one that is at the top of everybody’s list. He’s advised world leaders and has been honoured numerous times, not only for his incredible motivational and peak performance inspiration, but also for his tireless work on humanitarian issues. Tony was born in 1960 in North Hollywood, California. The eldest of three children, he had somewhat of a tough upbringing – his parents divorced when he was seven years old, and due to their personal issues, Robbins ended up becoming the primary care giver for his younger siblings. He left home aged 17, taking an unskilled job as a janitor. Who would have believed at this point that this young guy, making his way into the world with no qualifications and the product of a tough upbringing was to become such an incredible influence on so many people’s lives over the next few decades? Perhaps it was this very upbringing that made him the inspiration that he is to so many around the world today? Robbins soon left the janitorial life behind, and began helping one Jim Rohn by promoting his seminars. Rohn was a trailblazing American entrepreneur – an author and motivational speaker with a rags to riches story himself. This soon led to Robbins striking out into the self-help field on his own. He studied neurolinguistic programming and Ericksonian hypnosis, and his own reputation as a motivational speaker began to grow. Robbins released his first infomercial in 1988. Entitled “Personal Power”, this was the first of many – since then, these award winning features have aired somewhere in North America every 30 minutes, and continue to do so to this day! Along with a six-part TV series, his work has been featured in practically every credible news channel in the US today: Fox News, CNN, ABC’s Prime Time Live, NBC News, CBS Evening News…. You get the picture. 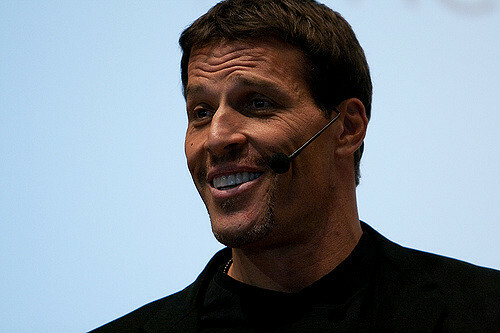 Robbins has written five books on the subject of personal development, each of which have been translated into 14 languages and are renowned worldwide. He’s also the creator of the world’s top selling personal and professional development system ever known – “Personal Power”, with over 40 million sold around the globe. Over the past three decades Robbin’s expertise has been called upon by some of the planet’s most powerful people. These include such esteemed names as Francois Mitterand, Margaret Thatcher, Bill Clinton, Mikhail Gorbachev, Nelson Mandela, Mother Theresa and Princess Diana. The US armed forces have also benefited from the unique system that Robbins has created to ensure that strategies used see individuals reaching every last pinnacle of their potential. It’s one thing being successful in your chosen career. But the mark of someone who’s truly passionate about what they do can be measured by what they give back to society. And this is where Robbins really shines. Nearly 30 years ago his conscience was pricked by two homeless families. His attempts to provide them with the basic nutritional needs that every human should have access to grew into the . This not-for-profit organization has reached into the lives of millions people around the world, and has led to an annual international holiday – ‘Basket Brigade’ – that feeds over 3 million people in 56 countries. It provides support for over 100,000 service organizations, 2,000 schools and 700 prisons. And every year the foundation provides a ‘discovery camp’ for more than 100 students from 18 different countries to design leadership programs that they can take back and initiate in their schools. The foundation has been awarded the top four star rating by independent charity watchdog, Charity Navigator. He is also sought after by some of the world’s leaders in psychology and psychiatrists for training. Robbins and partner Cloe Madanes created the Robbins-Madanes Center for Strategic Intervention. In addition to providing training materials for those working in the therapeutic industry, they are also responsible for training over 100,000 therapists in the system. The pair are also actively involved in the Council of Human Rights for Children at the San Francisco University. Toastmasters International have recognized Robbins as one of the world’s greatest speakers, bestowing upon him the ‘Golden Gavel Award’. Not only has he addressed such audiences as the Harvard Business School, British Parliament, and The President’s Summit for America’s Future, in 2006 his speech at the Technology, Entertainment and Design (TED) Conference, has become one of the top 10 most viewed in the history of TED. Robbins is currently Chairman of seven privately owned companies, each trading in varying fields. Whilst these might be diverse in nature (including education, hospitality and media production), each is a company that strongly believes in one of Robbin’s core values – improving the quality of life for people around the globe.